Aye, I thought to myself. Forsooth and verily, a fine question, m’lady. “I. . .” Indeed, who was I? And, perhaps more urgently, where was I in time? I was supposed to be a young man, a bachelor from London, who’d arrived five years ago aboard the good ship Fortune, trying to find my fortune in the Colony. But how to inform this visitor? My tongue stuck in my mouth. It felt about as useful as the woolen cap on my head. I stalled for time. “Good morrow. My name. . .” Stay in character, I thought. “My name is Stephen Deane. I am a miller.” I grimaced, fearing I sounded more pirate-leprechaun than 17th-century Londoner. But I had done it. I’d said my first words in the New World. Huzzah! 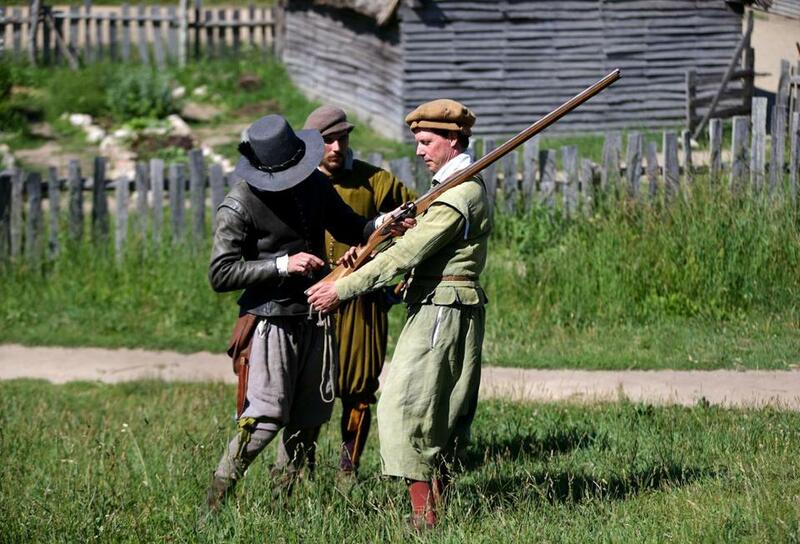 It’s not easy being a historical re-enactor at Plimoth Plantation. One must master not only the back story of a real person who resided there, but also his dialect and worldview, all the while wearing gorgeously crafted but not terribly comfortable period attire. Yet there I was, a nonprofessional, playing Stephen Deane. I was a Pilgrim for a day. I’d long been curious about Colonial-era America. As a kid, I made forts in the woods, ran around barefoot, and watched “Little House on the Prairie.” I dreamed of living in simpler times. That thinking has followed me into my adult life. When, by the grace of Richard Pickering, Plimoth Plantation’s deputy director, the opportunity to portray a Pilgrim presented itself, I could not resist. I wanted to know: How did the re-enactors prepare to interpret the past? What goes on there, behind the scenes? If I could be and work and “live” in the small village for a day, might the chaos of the 21st century finally fade away? Before I could become a bona fide Pilgrim, I required training. Typically, one person plays the same character all season, from mid-March through November. Some folks are well-known: Plymouth Colony Governor William Bradford, or Captain Myles Standish. Others, like Stephen Deane, the person Pickering had selected for me, were relative unknowns. 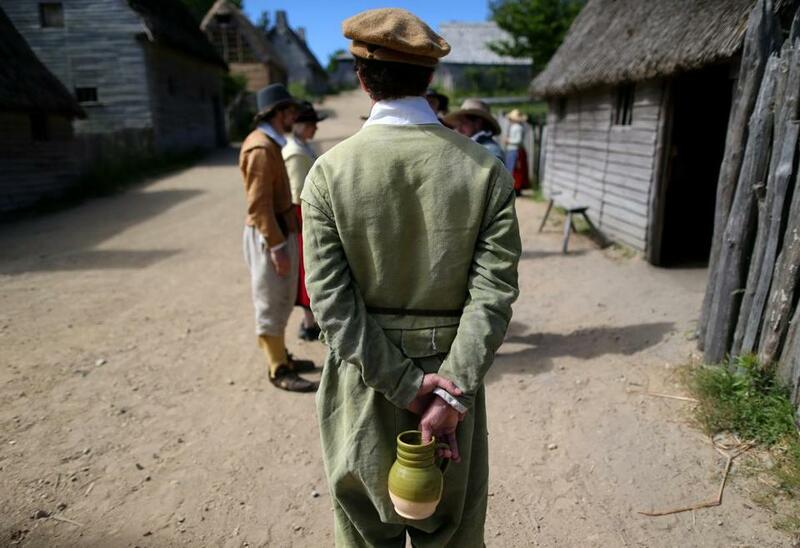 Re-enactors at Plimoth are trapped in a “Groundhog Day”-like time loop: Each year, they re-create 1627, seven years after the Mayflower has arrived. Why that year? It’s particularly well-documented in the historical record. “We even know which women are pregnant,” said Pickering. Each June 21, the wedding between Experience Mitchell and Jane Cooke is held. Because that’s a celebratory day of feasting, dancing, and revelry — and attracts loads of visitors — Pickering picked that date, the first of summer, for my debut. “We all need to have a past,” said Pickering, a Plimoth veteran since 1984. But not so much is known about Stephen Deane. A training dossier explained his bare bones back story: Deane arrives in Plimoth in 1621, and was at least 20 years old by 1627. He’s allotted an acre of land, and is eventually permitted to set “up a water work” — a grist mill — “to beat corn upon the brook.” His religious affiliation is unknown. He marries and has three kids. By 1633 or 1634, he is dead. Here, forever replaying 1627, Deane does not know his fate. After getting measured for my costume, I spent a week reading my dossier and practicing period speech. There are some 17 dialects represented at the plantation. Because of Deane’s origins, I was given a cassette tape of “The Dialect of 17th-century London.” Again and again, I listened as an instructor pronounced “goat” as “gawt”; “great” as “gray-et.” I tried to imitate the trilled R’s in “carrot.” I tried to memorize dozens of Elizabethan words: fain, perchance, wench. How now? Not so well. Unlike other living history museums, here role-players stay in character, and mustn’t speak of things of which a period person would have no knowledge. All week, I worried I’d wreck some starry-eyed tourist’s experience. What if I accidentally blurted out some reference to Big Papi, or giggled? “When you’re in the village talking to someone, you’re dropping a rock into the water and following the shockwaves,” Pickering said. “Where does the next question lead?” It was like acting in an improv period play, with no script. Luckily, playing John Jenney (with whose family Deane likely lived), Pickering would be at my side all day in case I screwed up. First stop: wardrobe. 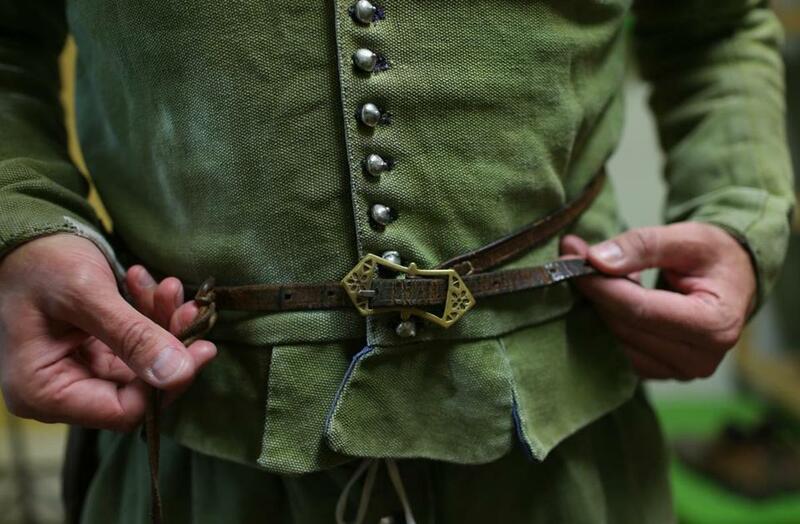 “There are no elastics in the 17th century,” said Denise Lebica, manager of Historical Clothing and Textiles, as she cinched my thigh-high woolen stockings with woolen garters. I donned a light green doublet and trousers made of hemp canvas, under which I wore a long, knee-length shirt. I chose some ill-fitting shoes, and topped it off with that woolen cap. Dashing. Gilsdorf in his hemp clothing. By 8:30 a.m., the employees began gathering in a rustic green room space. Some adjusted their costumes or sipped coffee; others, incongruously in full 17th-century regalia, stared at their laptops. Role-players took pains to make sure any out-of-period activity happened off stage. No one wants to see Barbara Standish guzzling a Coke and checking her iPhone. By 9, we marched toward the re-created village, passing a sign that stated, “Welcome to the 17th century.” There was no turning back. Plimoth Plantation consists of a large fort/meeting house, 18 wooden dwellings and outbuildings, plus garden plots and pens for livestock, all surrounded by a wooden palisade, and outlying hay and cornfields. As I, er, Stephen Deane arrived, the sheep and cows stared. Typically, there are 15 role-players on site. Because of the wedding, 30 were on hand. At “Morning Meeting,” we were given last-minute instructions about the day’s events and encouraged to help out in the fields. Re-enactors do work all day: cooking food, sawing wood, building homes, whatever is needed. My first task: fill a jug of water from the “goat house,” a secret employees-only barn (and location of the only modern toilet). It was going to be a hot one. After a final squirt of sunblock, and a quick lesson in how to tip my cap and bow, the first visitors arrived. And that’s how I found myself in the 17th century, wielding a pitchfork-like tool, “tedding” or fluffing up a field of recently cut hay, and working beside Chris Messier (playing William Brewster) and Norah Messier (as Anna Sprague), a real-life husband and wife. Brewster peppered me with period stories in an impeccable accent, and the morning passed quickly. “I enjoy other people being entertained by what I do. 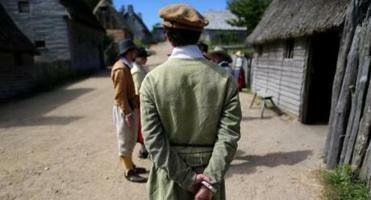 I’m a history geek,” Messier, 51, who has worked at Plimoth since 1995, later told me offstage. “I could be happy in other periods but I find the early modern period fascinating.” Indeed, I thought to myself, I could live here, in this religious utopian community, which shares in each other’s well-being. I’d forgotten, for a moment, how unbearable this place would be in January. Sometime before noon, John Jenney (Pickering) escorted me from the fields to the village. The main street was now crowded. We sat outside one of the houses. Keeping my mouth shut, smiling and nodding, I watched in awe as Jenney spun tales about religious oppression back in England, and admonished visiting men to seek “counsel of their wives” while, of course, still having the final say. I smiled. “I doth do well.” I vouchsafed, the food was most welcome: fish, lamb, rabbit, goat, salad with rose petals, pease tart, strawberry tart. I ate with my fingers and my knife. The only thing missing: a mug of ale. As the day grew long, I lost track of the hour. I participated in “pitching the bar,” a sort of primitive javelin sport, with John Winslow (Phillip Messier, Chris Messier’s real-life son). The father-son team later schooled me in musketry. I flaunted a few more phrases. “Are you in good health, m’lady?” I asked a visitor. “I shall see you anon,” I told another. I managed a halting conversation about the mill I one day hoped to build (even if I did sound more like a John Lennon-accented Yoda than a Elizabethan Age Londoner). I was beginning to get a hang of this New World. Gilsdorf (right) during manual of arms training. Quitting time approached, but I did not want to leave. Stephen Deane was in my consciousness, and I liked him living there, in my 21st-century brain. Ethan Gilsdorf is the author of “Fantasy Freaks and Gaming Geeks.” He can be reached at www.ethangilsdorf.com .